I am back from my much needed break and wanted to share what I have been up too. The break gave me a chance to work on several projects, including painting my new (old) chairs. There has been lots of shopping and creating going on around here. I’ll be back shortly to show you the completed chairs and the other items I have been working on. Steve and I spent a few days at St. Petersburg Beach where we ate lots of seafood, enjoyed the sunshine and got together with some old friends. During the break we also visited my favorite antique show and bought lots of great things. The Mt. Dora Extravaganza is held four times per year and has over 1400 vendors! found to be benign. Also, On 1/31/14 my dear Aunt passed away after a battle with cancer. never set up at a Vintage Market? Well, that is all about to change! On June 7th I’ll be a vendor at The Polka Dot Flea being held in Orlando, Fl. Carol writes the blog The Polka Dot Closet and is frequently a vendor at other Vintage Shows. She has put her knowledge, and so much work, into creating this show. I know it will be a big success and I am super excited to be a part of it. Below are three vignettes I put together for the flea website. Check out The Polka Dot Flea website and read more details on Carol’s blog. Now I have to get busy painting and creating. Welcome Back, Sherry! I've missed you. I'll check out Polka Dot Flea soon. Sounds exciting! Hi Sherry! I can't wait to see those chairs finished and congrats on the Vintage Market! Hi Sherry! You sound really excited…I am so happy for you. Are you going to shop for AND make some things? I think this will be great for you and right up your alley! How exciting Sherry!! I love the chairs in that first photo…can't wait to see how you transformed them! Welcome back Sherry!!! I saw your name on Carol's list of vendors and thought…yay…Sherry is getting back in the business. Carol's show should be wonderful. So glad that the lump was not cancer (I had the same thing happen to me back in Nov. and it really scares you). Looking forward to seeing the chairs after their makeover. Welcome back, Sherry, so nice to hear from you, especially glad that you are okay!! Good luck with all your projects; sounds very exciting! Welcome back, Sherry!!! You have been missed. Glad you have had some fun and that the scare was just a scare. The Flea sounds like alot of fun! Wish I could be there, that area of Fl. is near my sister. We will be visiting her in March, will it be open then???? Congrats on your new venture! It sounds like fun. Glad to hear that your scare with just that! Glad to see you back, Sherry! I think the Polka Dot Flea will be awesome, wish I lived closer! Cheers for all benign results! May everyone get such good news. Congratulations to you on getting back into sharing your wonderful wares with the shopping public!! Loved the photos and wish the Polka-Dot Flea market wasn't so far away … as if I could get more furniture and stuff in this house! Have you heard about a flea market somewhere in FL called Fancy Flea? One blogger there used to have marvelous photos of that venue. Congrats on doing the Polka Dot show, Sherry. I love The Polka Dot Closet blog. She is a lovely person. Have fun getting ready for the big show. Did you use your camper in St. Pete? I was trying to think where there were any campgrounds there. the chairs are wonderful, and I'm so excited to hear about your venture into the market event scene. sounds like lot's of fun! You posted so many things I don't know if I can respond to them all! Needless to say, I am grateful your cancer scare went away as quickly as it arrived. It's great that you are taking time for yourself now, as I see a whirlwind in your future! LOL! You have made good with your time off Sherry! Can't wait to see your finished chairs!!! And congrats on your new venture…sounds exciting! Also am glad to hear that your lump was benign…but what a scare that must have been for you. My condolences too on the passing of your aunt. Good to see you are back…missed reading your posts! Oh for cripes sake that's what you needed a lump…Glad all was fine! But, then you lost your aunt…When it rains it pours and you have had enough already!!! Thank you Thank you for the shout out on the Polka Dot Flea!!! You sent a lot of readers my way! 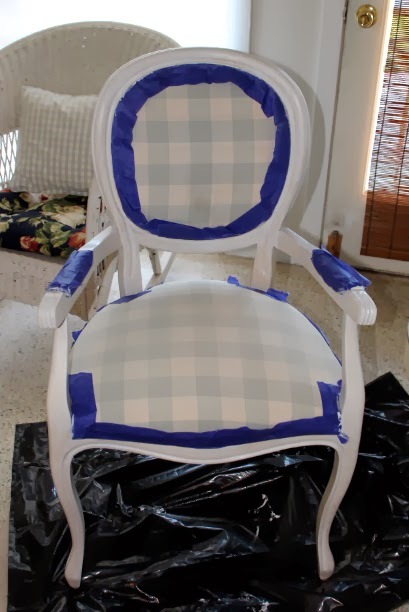 The chair looks great, but I think it would look better without the blue tape…Just saying lol!! Welcome back Sherry! Love the chairs and can't wait to see their new look! Hi Sherry, so glad you had a wonderful break and the scare is behind you!…I am marking my calendar for the Polka Dot Flea!…Hopefully if my schedule works out I can travel to Florida for the event!…So very exciting!!…Congrats!!! You'll do great at the show. Your things are always so fabulous. 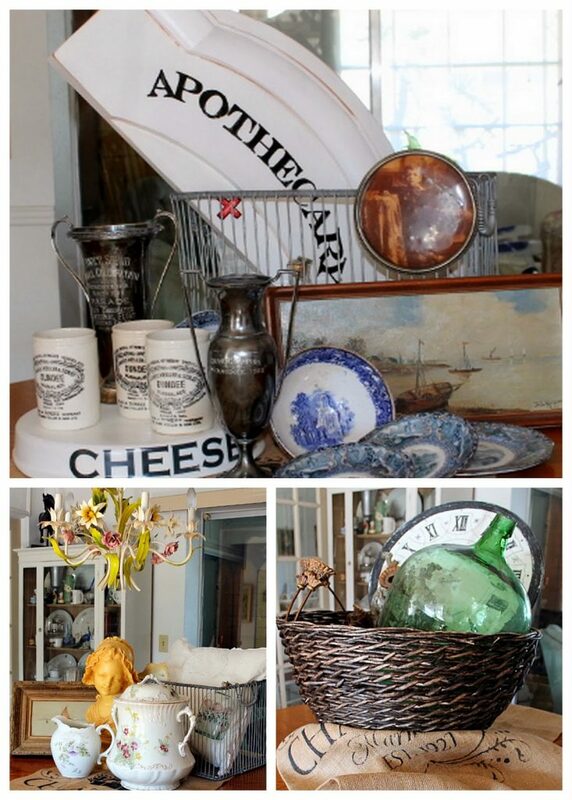 I actually see a few things I "need" in your vignettes! I am sorry about your Aunt, and glad yours was benign…. I am excited about your chairs….and it sounds like you had fun shopping…. Congrats on doing the show. I am so bummed that I can't go to FL for the show. I know it will be fantastic and I am so happy for Carol too. Think, air conditioning and a great s how to shop, fantastic combination. I can't wait to see t hose chairs finished. I'm glad you're back and I'm so happy that you are well! I'm sorry about your aunt though. It sounds like you had some fun while on break and I look forward to seeing what projects you have up your sleeve! Time well spent and congrats on your new venture! Carol must be so excited to have you part of her new venture/adventure! Welcome back. Welcome back! Your time has been full while away from the blog. Sorry about your aunt. Lucky you, being at the polkadotcloset flea! How exciting Sherry! Wish I lived in Central Fl.